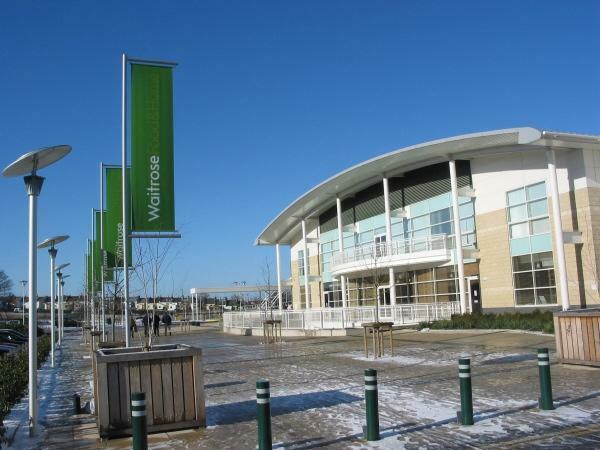 Waitrose Cheltenham is located on the former St James Station and was very complex to develop due to the need for extensive works including the diversion of the River Chelt, a new section of internal ring road, strengthening works to two victorian bridges, diversion of services including the relocation of three substations and the problems of a contaminated site. 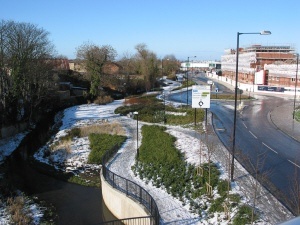 Hurst Peirce + Malcolm LLP advised Waitrose on the feasibility of developing the site, negotiated with the Environment Agency with regard to the river diversions, river corridor, flooding regime; with the statutory authorities and local authority. We also carried out the feasibility design for the store itself which includes underground warehousing and parking.The contract was let as a design and build contract for which we prepared the employer's requirements. During construction we acted as contract administrator for the infrastructure works. 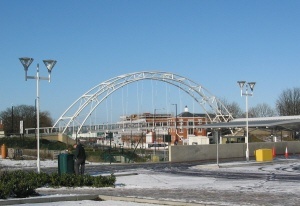 The river formerly ran across the site under the proposed location for the store. This was diverted into a new culvert, and down a hydraulic drop structure where the flow was split into an above ground open channel provided to give a better environment, together with a high flow flood culvert. The two flows merge in a basin at the foot of the adjacent photograph. They then flow down the old river channel which was widened and the bank profiled to accommodate a larger flood flow to conform with the Environment Agency's flood scheme for Cheltenham.